Single checkpoint: A patient at the centre for rehabilitation, Kokilaben Dhirubhai Ambani hospital, Mumbai. Tucked in a quiet corner on the 10th floor of PD Hinduja National Hospital and Medical Research Centre, Mumbai, is a cluster of consulting rooms. What strikes you as odd is that Nina Madnani, a dermatologist, sits next to Ashwini Bhalerao-Gandhi, a gynaecologist. Walk to the nurse’s booth and browse through the brochures on the desk and you realize where you are—at PD Hinduja’s Vulvar Clinic. At Fortis Flight Lieutenant Rajan Dhall Hospital, New Delhi, a chest specialist, pulmonologist, respiratory therapist and special nurse come together in a room near the pulmonary function lab thrice a week. An unlikely gathering of people, but they collaborate to run the Infectious Disease Clinic. 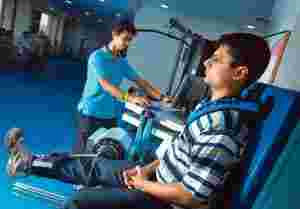 At Mumbai’s Kokilaben Dhirubhai Ambani Hospital and Medical Research Institute, the centre for rehabilitation has an entire wing dedicated to sports-related injuries. The clinic brings together not just orthopaedics, sports-injury specialists and physiotherapists, but also has a six-camera Gait and Motion Analysis Lab and rehabilitation room. From dedicated floor space to makeshift clinics, from combined consultation rooms to disease-specific diagnostic labs, from multidiscipline treatment to early detection—India’s speciality hospitals are leaving no stone unturned to provide world-class healthcare. The Gait and Motion Analysis Lab at the same hospital. “There are certain diseases that require multidiscipline attention. Systemic lupus erythematosus (SLE) is one of them, for which we run the SLE clinic," says Jatin P. Kothari, nephrologist at PD Hinduja hospital, Mumbai. SLE is an autoimmune disease, which means the body’s immune system attacks healthy tissues. SLE can lead to long-term (chronic) inflammation in joints and kidney problems—requiring both the attention of a nephrologist and rheumatologist, which is where Dr Kothari and his colleague, rheumatology specialist C. Balakrishnan, come in. “The idea is to create a space were we can provide patients specific care. Dr Balakrishnan and I sit together during these sessions and give our joint opinion and even offer treatment, medication and disease management in union," Dr Kothari says. Combined consultancy in a common space helps patients clear their doubts, and the doctors too can consult each other and work as a team according to the patients’ requirements. Started two years ago, the SLE clinic functions at the hospital premises once a week. “On an average we see 120 patients," says Dr Kothari, who also uses the clinic as a counselling centre—SLE can have a deep emotional impact on an individual’s life, especially with some women unable to conceive. PD Hinduja hospital’s Diabetic Foot Clinic is another example of a multidisciplinary care centre. “In the long term, diabetes can affect the heart, kidney, eyes and feet. While most people keep a check on the first three, the feet are often neglected. Hence the foot clinic," says Arun Bal, a general surgeon who initiated the Diabetic Foot Clinic simply because “I was amputating more diabetic gangrene cases than actually treating them". Dr Bal says 15% of all diabetic patients develop diabetic foot, which means the nerves and blood vessels on the base of the foot harden. Blood circulation is affected; wounds don’t heal and footwear must be designed specially. Keeping in mind these requirements, Dr Bal works in close association with an orthopaedic, a doctor from neuropathy and vasculopathy and qualified paramedics. “The idea behind these clinics is simple. Make healthcare delivery patient-specific," says Vijay Gupta, director marketing, PD Hinduja hospital. “A patient doesn’t need to run from one place to another to meet doctors or to have tests done. We provide everything for them in one space." The Kokilaben Dhirubhai Ambani hospital, too, follows a similar philosophy. Their Diabetic Foot Clinic has a fixed space with a foot scanner (which scans the nerves, bones and muscular atrophy in the foot), a biothesiometer (to check sensation) and a vascular doppler with a diabetic educator. Their Travel Clinic is held once a week by Tanu Singhal, who has been trained in travel medicine at the London School of Hygiene and Tropical Medicine. The Travel Clinic is a one-stop-shop on the vaccinations, injections and precautions to be taken before leaving for another country. The clinic also provides almost all the vaccinations. “Having a specific clinic means the patient doesn’t have to go to three-four doctors and then reach his/her diagnosis. We help them track their needs at the onset," says Ram Narain, chief operating officer and cardiothoracic surgeon, Kokilaben Dhirubhai Ambani hospital. Also, sometimes, patients can end up paying the fee for just one consultation while two or more doctors actually work on their case. Having such clinics can also help create awareness about the disease, as it has for the Vulvar Clinic at the PD Hinduja hospital. “Most women think if they have an itch, a swelling, a rash or a boil ‘down there’, they must go see a gynaecologist. But the truth is ‘down there’ is the vulvar region and it’s all skin, which needs as much care as the skin anywhere else on our body," says Dr Madnani, who had to fight to retain the name Vulvar Clinic. She was told by the hospital management that the name might be offensive and could make people uncomfortable. “An opinion that," she says, “is irrelevant looking at the number of women who live with a vulvar or vaginal itch for most of their life." Dr Madnani conducted a study of 70 women (at her clinic in Mumbai and the hospital) and found that each one had complained of an itch in the vulvar region and had been prescribed anti-fungal medicine by a gynaecologist or general physician. She says her examination showed most either had lichen simplex, lichen planus or lichen psoriasis—all skin-related infections—and hence should have been examined by a dermatologist. Dr Madnani uses every platform available to create awareness about the clinic, but her greatest attempt at raising awareness lies in calling the clinic what it is—Vulvar Clinic. Urologist Anshuman Agarwal at the Fortis hospital, Delhi, is also trying to create awareness. Slated to start in a couple of months, the Fortis hospital’s Incontinence Clinic will be the first of its kind in India. “My main aim through this clinic is to create awareness and provide support. Incontinence is a disease where the muscles around the woman’s urethra weaken and the urine leaks out involuntarily. Women often are embarrassed to talk about it or get diagnosed. Some become a social recluse," says Dr Agarwal. The popular belief is that the disease inflicts woman in their 60s, but statistics have shown that the age is coming down and even those in their 50s have incontinence—over 25% of post-menopausal women suffer from incontinence in India. The world over, the problem with incontinence is late diagnosis due to lack of awareness or embarrassment in approaching a doctor. “Creating a space where women with similar problems come together helps as they feel reassured that incontinence is common and can be resolved," says Dr Agarwal, adding that he will work in consultation with a gynaecologist. “This is a urologist’s job but women open up to gynaecologists easily, so I have collaborated with one," says Dr Agarwal. The Infectious Disease Clinic at Fortis hospital, Delhi, is another such success story not just for patients but also for doctors. Conducted thrice a week for 2-3 hours, the Infectious Disease Clinic looks at a host of diseases: typhoid, dengue, malaria, tuberculosis, viral infections and HIV. The medical team comprises a chest physician, pulmonologist and specialized paramedics, among others. “As a doctor, this specific or dedicated clinic has been a brilliant learning experience. I am only focused on the gamut of infectious diseases, which means I am able to understand the diseases better, and hence make a better diagnosis and prognosis. This is one of the best ways to treat a disease from both the patients’ and doctors’ perspective," says Vinod Nangia, an infectious diseases specialist at Fortis.